At Core Rehabilitation we provide physical therapy…. with a difference! What is physical therapy for? Physical therapy can help anyone who is suffering from musculoskeletal injuries, or recovering from surgeries. It can also help with other difficulties such as balance/walking problems, or neurological problems from a stroke or acquired brain injury. Even people recovering from non-orthopedic surgeries (internal problems, cancer) can benefit from physical therapy by regaining strength and endurance and for complications such as swelling (lymphedema). The realm of physical therapy is huge and encompasses the whole body and its functioning. To learn how physical therapy can specifically help your condition, make an appointment with any of our locations for a Free Injury Screening. Can I choose the physical therapy clinic that I go to? Not all physical therapists or practices are created equal and you can choose where to receive your treatment. Sometimes your physician will recommend a specific therapist or practice to you; sometimes your insurance company will require you to go to specific therapists or practices. You always have the right to ask for a specific provider. We are “in network” with most major insurances (Medicaid excluded). See this list for accepted insurances. If we are not "in network" with your specific insurance company, many have out of network options that still provide coverage. 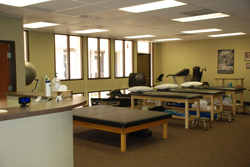 What makes Core Rehabilitation different from other physical therapy clinics? Our physical therapists are hands-on manual therapists that employ a variety of techniques and skills to get their patients back to full function as quickly as possible. We only employ licensed professionals to work with our patients. We do not employ physical therapy technicians or people without formal education to help with patient care. We are privately owned by physical therapists. This allows us to focus more on patient care and excellent patient outcomes instead of a bottom line and manipulations by corporate influence. 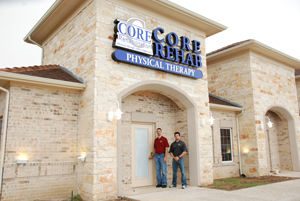 It is easy and convenient to schedule your physical therapy appointments with Core Rehabilitation. For patient convenience, we have an office in Keller, Bedford and Justin. We are also open six days and week and have early morning and evening appointments available. Our physical therapists are specialized in cutting edge care, and keep up-to-date with the latest research and evidence.